The Macramé Conference: The Beautiful Word, Baby Brave, Lisa Marie Glover... and us... lastnight at Sound Food and Drink. By Ruth. The Beautiful Word, Baby Brave, Lisa Marie Glover... and us... lastnight at Sound Food and Drink. By Ruth. Want to know a boring fact about me? Of course you don’t! But you’ll get one anyway: alcohol is sometimes a migraine trigger for me, so I mostly avoid it all together. The negative side is that I feel a bit of a party pooper ordering a lemonade when a venue is kind enough to offer free booze to performers. The positives, however, include “being able to remember stuff”, and I’m especially glad I’ll be remembering last night’s gig because it was AMAZING. 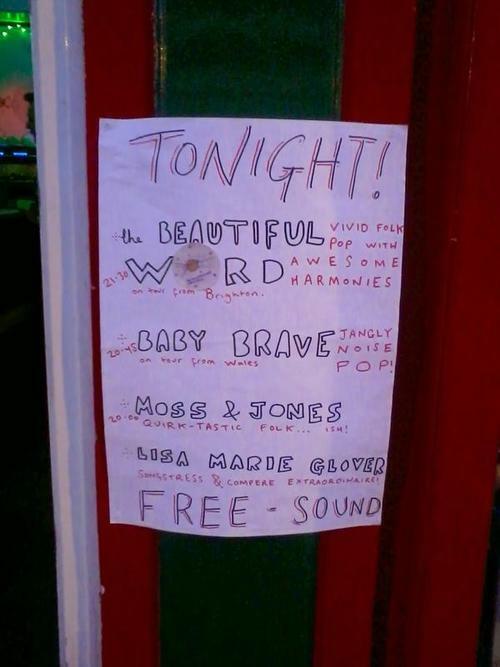 I was on twitter on Saturday and learned that one of my favourite bands ever, The Beautiful Word, were doing a last-minute gig in Liverpool, at Sound Food and Drink on Duke Street (by the way, we bought some pizzas there and they were DELICIOUS). I was just in the process of shouting to Marc, “oh my god Marc, The Beautiful Word are doing a gig in town, we have to go!” as I received a tweet asking if we’d open the night with a set ourselves! Needless to say, I said YES PLEASE! In fact, the night opened with a lovely surprise in the form of Lisa Marie Glover, the compère for the evening and a talented singer/songwriter, who played a couple of her witty, melodic songs in between sets. Needless to say, we bought a CD. Perhaps you should too? Then it was our turn. We played a mix of originals (including Millbrook, the one about the ice cream van in Kirkby, and Shepherd’s Delight, which you can download for just 50p if you like), traditional music (including our uke/glockenspiel instrumental of Henry VIII’s Pastime With Good Company, and our acappella arrangement of Let No Man Steal Your Thyme) and covers, including our folky cover of Ebeneezer Goode, which a lot of people seemed to like. Next up came Baby Brave. This lot call themselves “noise pop” and they’re right; foot-tapping, singalonging in-your-face wonderfully raucous songs with ludicrously catchy hooks. Of course, we bought their EP (on tape as well! TAPE!) which you too can own as a digital download! I especially liked Alone in Tokyo, and Colours (how can I not love a song with a verse in French?) - I’d definitely go and see these again; hopefully they’ll be up in town again at some point soon as Wrexham’s not a million miles away. You should go and see them too. They’re ace! Finally it was time for The Beautiful Word. Now, I’ll admit, I’m biased. The first time I saw these live, a couple of years ago now, I texted Marc, “I’ve just found my new favourite band”. I own their album Particles, and it is gorgeous, but there’s nothing quite like seeing a band live, and The Beautiful Word are no exception. They started out with an adorable song called Starfish which they said was new, but I had the weirdest feeling I’d heard it before; maybe it was just so catchy that it made me want to sing along immediately? In fact, they played a couple of new songs during the evening, all of which I thought were fantastic and look forward to hearing when they’re able to record again. They also played a couple of songs from Particles, including one of my favourites (heck, they’re all my favourites, but you know what I mean), Emily. Time for our usual, and admittedly slightly self-indulgent section of WHAT HAVE WE LEARNED FROM THIS GIG? Without going into too many embarrassing details, we need to be FASTIDIOUS about tuning. We need to sort out our merch. The ladies’ loo in Sound doesn’t have a sign on it … thus it’s easily mistaken for a unisex one. Oops, as Marc said on realising this! Anyway, that’s all folks. Thank you to everyone who came, and to those who couldn’t come but helped get the message out. Our next full-length gig is at the Bombed Out Church in Liverpool on Sunday 31st August at 2pm, quid on the door (which goes to the church) and our special guests are the fabulous Laura&Claire.